It is time for ODBD Stamping In Time on assignment challenge(SNTODBD12)! The challenge hostess for this three week challenge period (due to the July 4th holiday) is LeAnne Pugliese. LeAnne is challenging us with an inspiration picture! Be inspired by the colors, shapes, patterns, or design in the picture! Enjoy and have fun! We would love to see what you create using Our Daily Bread Design stamps! You have until July 7th to link your card to the ODBD Stamping in Time post. When uploading to on line galleries, please use keyword SNTODBD12. Here is the inspiration photo: For my card I used Our Daily Bread designs set "From Me to You" and stamped in Chocolate Chip Ink. The dp is BasicGrey Sultry and the cs is Kiwi Kiss, Papertrey Pink and GPW. I used Card Patterns Sketch #68 for my layout. 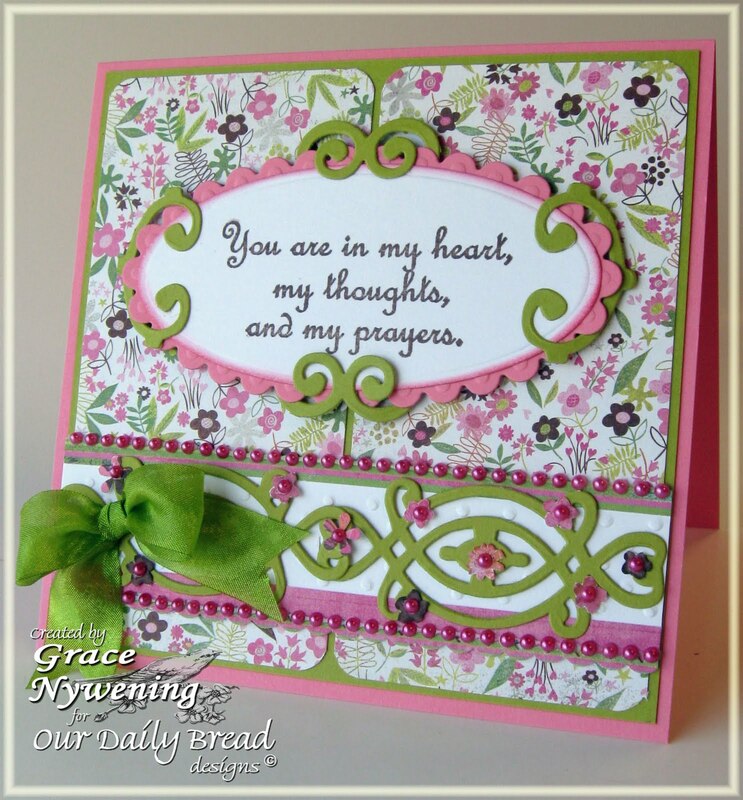 Card Details: Spellbinder's Mega Ovals and Scalloped Ovals, CB "Ornamental" die cuts and swiss dot ef, MS Scalloped hearts edge punch, May Arts Soft & Silky ribbon, SU! Corner Rounder and pearls by Mark Richards. 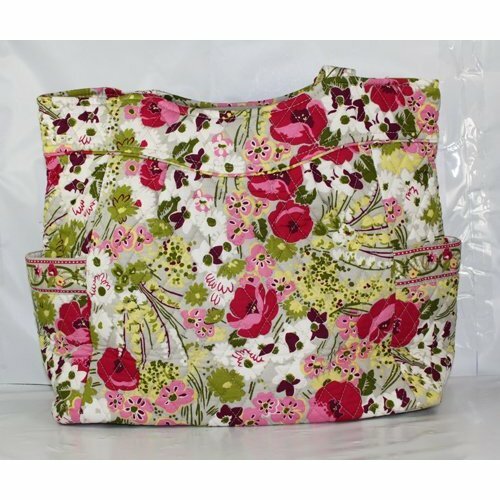 I wove the different elements of the die cut together to replicate the feel of the side strips on the bag, then fussy cut some of the flowers out and adhered and added the pearls. Hope you like it~ thanks for looking! Stampin Royalty - another picture inspiration of flowers and summer colors... perfect! This card is just stunning. Lovely color combo, great papers and details. What a beautiful card Grace,i love your image. So gorgeous papers and the colours. 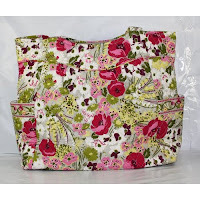 Grace, I am so in awe of your fabulous designs! This is stunning, I love all the elements! Very pretty, Grace. I love greens and pink together. So so beautiful Grace, LOVE your layout, dp, and those fabulous die cuts....GORGEOUS work sweetie!! Hope you are having a great day! Oh, Grace!! Your card is sooooo gorgeous!!! I soooo want to be you when I grow up!! Thanks for your constant inspiration!! God Bless!! Beautiful card, great combination of paper and sentiment. Thanks for joining us at Sentimental Sundays. Grace, this is fantastic! I love the colors, the patterns, the details. What an amazing card! Absolutely beautiful, Grace! Wonderful choice of dp for the tote bag, too! Love your extra special touches! Beautifully done! This is just gorgeous!Thanks for playing at Card Patterns! Wow!!! What a gorgeous card....you are one very talented lady! Beautiful card Grace.. I really like the way you used your dies.. That inspiration bag goes so well with your card. Wow, I adore this card...and it is a very close replica of that VB bag also!! You aced this challenge and made a beautiful card in the process!! wow Grace, you have been busy, there are some gorgeous crafts here...great style...hope you are well too..have a wonderful weekend! Absolutely beautiful card! I LOVE those flourishes! Very pretty! Great springy colors and I like the sentiment focus. Oh those die cut scrolls are just so beautiful Grace! This is such a well laid out card! Very pretty card. I really like the colors and the paper you used, and those fancy die-cuts are fabulous. Thanks for joining us this week in the Tea Room. Gorgeous card-perfect sentiment. Thank you for joining us this past week at Sentimental Sundays! This is just perfect DP for the inspiration piece!!! Thank you for taking my "thoughts" and interpreting them to such a gorgeous card! Super pretty!! I LOVE the border detail!